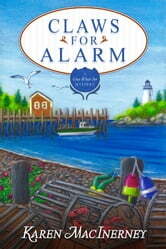 It's summertime on Cranberry Island, and things are heating up for innkeeper Natalie Barnes. She may be hosting a yoga retreat, but things at the Gray Whale Inn are anything but Zen. Between juggling dietary restrictions and managing flaring tempers, Natalie's about ready for a retreat of her own... far away from the inn's fit but finicky guests. Unfortunately, there's no reprieve on the island. The lobster co-op and pier are under threat once again, this time by a new arrival whose vision for Cranberry Island looks more like a spread in Coastal Living than a quaint Maine fishing village. When the instigator turns up dead next to the co-op and the police start fishing for suspects, Natalie's dear friend Claudette is the one they haul up. Will Natalie trap the killer in time? Or will she be next?